Syrian Rock Grayling [Eastern Rock Grayling], Sylvandre dalmate, Бархатница сирийская. The species is found in Greece, on the island of Samos, Turkey, Bulgaria, Albania, Republic of Macedonia, Caucasus and Transcaucasia. Armenia is inhabited by nominate subspecies which occupies predominantly deciduous forests, sometimes occurring also in juniper woodlands. The elevation range occupied by the species is from 1000 to 2200 m a.s.l. There is still a question about populations which inhabit northern forests of Armenia as it is suggested by some authors that they belong to the close species Hipparchia fagi (Scopoli, 1763); the question is a subject of further clarification. The larval host-plant is Holcus spp. The species gives one generation per year, the butterflies occur from mid June till late October. The species is slightly uncommon within typical habitat, demonstrating stable population trend during 2003-2013 (p>0.05). However, its density is noticeably lower in degraded forests, which means that the species could potentially suffer from unsustainable forest logging practices, but the changes on population level could be visible during longer periods of time. The species is not included in the Global and Armenian Red Lists, as well as in CITES and Bern Conventions. In European Red Book the species is recorded as Least Concern. 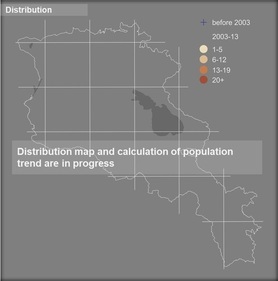 It appears that due to stable population trend, even though the species is sensitive towards habitat changes, it can receive the Armenian status - Least Concern as well. Part of its distribution range is included in Protected Areas' and Emerald Sites' networks, and it is presented in Prime Butterfly Areas Lichk, Gyumorats, and Kajaran. Although at current the species does't require special conservation measures, it is important to continue its monitoring for identification of possible changes in the Syrian Rock Grayling's population. Also it is important to clarify whether there are two species occupying Armenia (Hipparchia syriaca and H. fagi) or only one.